….except that you don’t have to take current into account, and maybe the tractor is a little slower. The protective gear is a little different — no hay blowing offshore southern California — and no weapons qual is required. You have to keep looking forward to see where the windrow is going, and to the side and back to ensure that the baler is correctly aligned, and then far aft to make sure nobody has fallen off the hay rack. 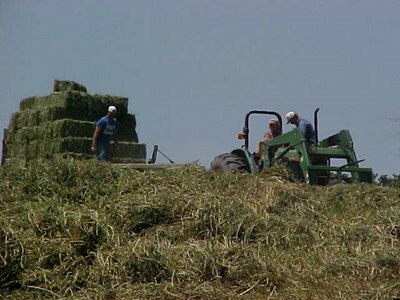 If you’re moving over a sharp change in terrain, you have to take into account how the tractor, the baler, and the hayrack will move through it in order to avoid damage or injuries. Oh, and one shouldn’t make any sudden starts or stops, either. It’s all just like my first coxswain, Norm Thorndyke, taught me twenty years ago — maintain 360 degree situational awareness, make small adjustments so you don’t have to make big ones, and keep an eye on what those goobers on the stern are doing. G., our neighbor, says I have a tendency to want to crowd the windrows. Gee, where I have I heard that before?